As the Senate continues to hold votes on repeal of the Affordable Care Act (ACA), it appears more and more likely that Senate leadership plans to offer a “skinny” version of ACA repeal as the final version that senators must vote on. This version would reportedly repeal the individual and employer mandates and the medical device tax. This plan is simply a feigned retreat; the Republican leadership’s end game most certainly includes cutting financial assistance for people buying insurance in the individual market, ending the ACA’s Medicaid expansion, and capping federal support for the remaining Medicaid program. Both the House-passed American Health Care Act (AHCA) and the Senate-introduced Better Care Reconciliation Act (BCRA) include these draconian changes. If senators fall for this maneuver and pass the skinny ACA repeal bill, a limited number of senior senators and their counterparts in the House of Representatives would then meet in a conference committee, during which they would make changes to the House and Senate-passed versions of the ACA repeal legislation so that both versions are identical. At that point, Republican congressional leaders could execute their plan to re-insert provisions that lower financial assistance, end the Medicaid expansion, and cap support for the program. The version approved by the conference committee would then be voted on by both the House and the Senate, with no opportunity for further changes or amendments. If the bill passes, it would then go to the president for signature into law. But the skinny repeal bill alone—without the reinsertion of provisions from the AHCA and the BCRA—would still have devastating effects on health insurance coverage if it became law. It would jeopardize consumer choice in the individual market by creating chaos and uncertainty for issuers in the marketplace and increasing premiums. Consumers who were not subsidized, including those who buy their coverage outside the marketplaces, would pay the full premium increase from mandate repeal. For consumers eligible for subsidies, any 2018 premium increase would largely be mitigated by increased premium tax credits, and therefore borne by taxpayers. Because insurers must finalize their 2018 rates in just a few weeks, any further changes to the market rules for 2018 could force some to withdraw altogether. The repeal bill poses an even greater risk in states with fewer insurers offering plans in the individual market. In 2017, for example, there was just one insurer offering marketplace plans each county throughout Alaska and Arizona. Many counties in other states, including Colorado, Nevada, Utah, and West Virginia, also have just one insurer. Given the uncertainty created by congressional action on repealing the ACA and the administration’s repeated actions to sabotage the law, insurers remain very nervous about participating in the marketplaces next year. As of July 26, 2017, four counties in Indiana, 14 counties in Nevada, and 22 counties in Ohio were at risk of having no insurer in the marketplace in 2018. 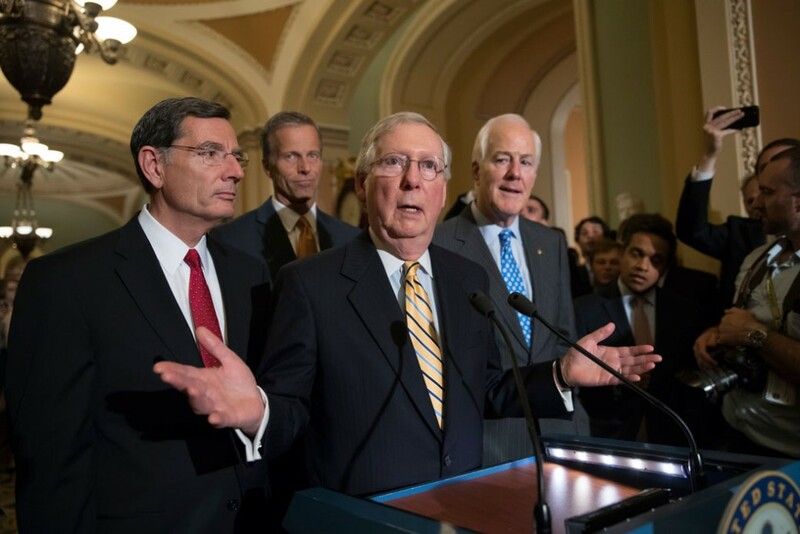 Voting for the skinny repeal bill authorizes Senate Majority Leader Mitch McConnell (R-KY) and other opponents of the ACA to finalize in secret an ACA repeal bill that will harm millions of Americans. Senators should not fall for this political maneuvering. To estimate what average premiums would be next year, we used information on the 2017 average premium and inflated it to 2018 rates. Among states that reported average 2017 premiums to the Centers for Medicare and Medicaid Services, the average was $471 per month, or $5,652 annually. To estimate premiums for a 60-year-old, we started with the U.S. Department of Health and Human Services report on state average benchmark silver plan premiums and then adjusted those averages to reflect premiums for a 60-year-old. Average premium and benchmark premium data were not available for all states. Under implementation of the ACA, including continued payment of cost-sharing reductions and enforcement of the individual mandate, premium increases next year would reflect mostly increases in medical trend. The consultancy Oliver Wyman predicts that premiums should rise about 8 to 11 percent in 2018. We used the midpoint of this prediction, 9.5 percent, to estimate 2018 average and benchmark premiums. To apply the CBO’s estimate that premiums would increase by 20 percent relative to current law, we applied that increase to expected 2018 premiums under the ACA implementation. We estimate that without the mandate, the national average marketplace premium would be $7,427 next year, $1,238 higher than it would otherwise be. Emily R. Gee is the health economist for the Health Policy team at the Center for American Progress. Maura Calsyn is the managing director for the Health Policy team at American Progress.